Save money when you buy, sell, or refinance a home! Homes for Heroes, Inc. was created shortly after the tragic events of 9/11 as a way to say “Thank you” to those who serve and sacrifice so much. It is our mission to provide extraordinary savings to heroes who provide extraordinary services to our nation and its communities every day. 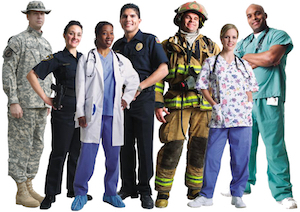 Qualifying heroes: Firefighters, Law Enforcement, Military (Active, Reserve & Veterans), Healthcare Professionals, EMS, Teachers Connect with a local specialist today to maximize your savings. Hero Rewards is our way to say “Thank you” for your service. When you work with Homes for Heroes affiliate real estate specialists and local business affiliates, you can save on your home and on every day home-related purchases. Learn How Homes For Heroes can help save you money today!